Why sit when you can stand? Working at the office or at home while sitting for long periods of time can be detrimental to a person’s health (desks should come with warning labels). Research has shown that those who work or play video games while sitting for hours can lead to a host of problems, including heart attack, stroke, metabolic syndrome (cardiovascular disease and diabetes), and lower life expectancies. Suffice it to say, sitting + increased time = bad health. Unfortunately, some things workers try (jogging in the morning, hitting the gym during lunch, etc.) to combat the problem will not help overcome the declining health associated with sitting for eight to 10 hours during work. Sure, there are some tricks, such as walking periodic laps around the office during breaks, stretching or moving while seated, and the often-overlooked standing desks that can help maintain a healthy mind and body. Yes, any standing-type desk will do for most office workers looking to maintain their life expectancies, but then again why be like most office workers? The Stir Kinetic Desk allows the worker behind it to go from sitting or standing with the tap of a touchscreen. Those looking to “stand” outside the box may want to look at Stir’s Kinetic Desk, which is outfitted with a host of smart technology that helps alleviate the nasty side effects that sitting causes. The desk itself is outfitted with a pair of actuated legs that raises or lowers its height (26-inch range) with the tap of a button for a customized fit. An embedded touchscreen control panel provides an interface for users to control every facet of the smart desk, including adjusting its height, monitoring how many calories have been burned throughout the day, as well as how long you’ve been sitting or standing. The desk works by gaining awareness of when the user stands in front of it using an embedded thermal sensor. 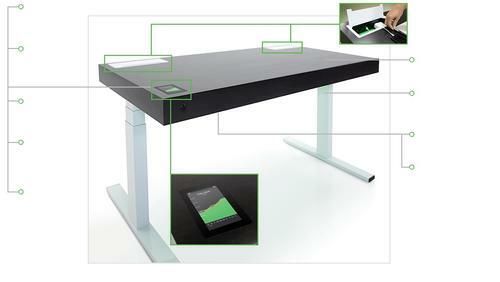 Users then adjust the height of the desk using the interface for a customized fit. Once that’s done, specialized software “learns” over time how long they prefer to stand or sit and adjusts itself accordingly using “WhisperBreath,” which moves the desk up and down ever so slightly to let the user know it’s time for a break. After the desk learns the user’s preferences it can then be initiated into “Active Mode” through the push of a button on the front of the desk. Every time users arrive, they simply push that button to initiate the workday. The Kinetic Desk also features two hardware/hardwired hubs embedded into the top of the desk, which feature both Bluetooth and wireless connections for mobile devices, as well as electrical outlets and USB ports for anything the user needs to connect. This feature alone is priceless as all cable connections can be kept out of the user’s way while working, and provides stability for connected devices while moving up and down. Stir’s Kinetic Desk will begin shipping soon, starting at $3,890, with two color options for the desks lacquered wood face and four options for the desks trim and access ports. Can you really put a price on good health?